Today also is Day 4 of Round 9, which means its time to start the chemo. Hopefully this chemo remains easy on her stomach and she does well and can handle school ok. We will do the chemo at night since there really is no other time that she can do it since she is in school and then having 3 hours of no eating. She did really well with this when we did it during Round 8, so I'm sure she will handle it well this time. Because her weight went up, Dr Gowda increased her irenotecan a little bit also. We are hopeful for another easy round of chemo. Daddy went and had lunch again with Emily today since he was is working late. Emily enjoys having daddy come for lunch just as much as daddy enjoys going. Busy times coming ahead with celebrating Emily's younger sisters birthday Thursday, she will be 4. Older sister has a dance on Friday night and then 2 birthdays next week, daddy's birthday on October 2nd and older sister Jessie's birthday on October 3 (she will be 12)! Just a quick update with how things are going. We will continue to keep you up to date. Part of Origami Owl's Mission statement is to "Be a Force For Good" so Tammie Darko has chosen to donate 15% of all sales made through this fundraising party for the month of September to Emily's Journey to fight Neuroblastoma. 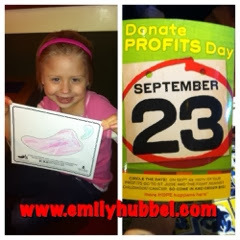 Please take a moment to read about Emily Hubbel's Journey. 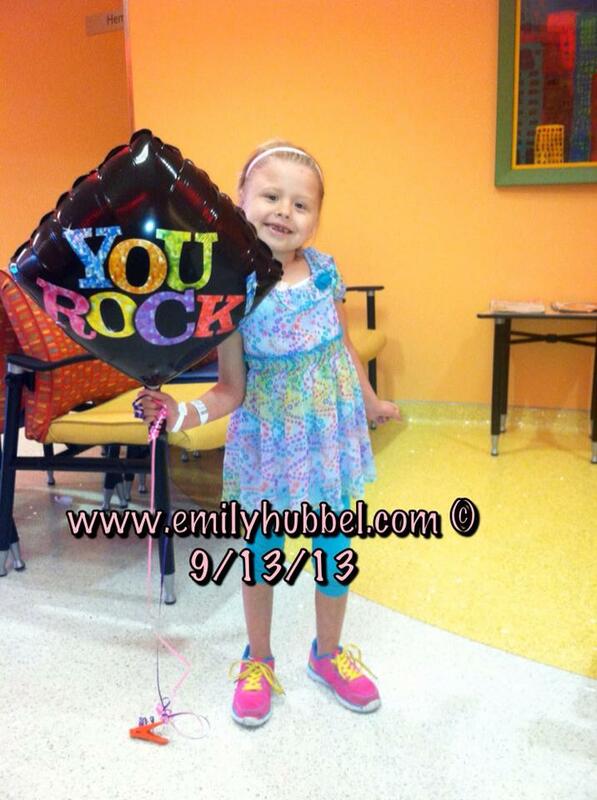 She will also be donating "Warrior, Fearless and Hope" Tags" to Emily's family. Emily had clinic today for us to talk with Dr Gowda to go over results and where things stand as of today and how we are moving forward. Final results show uptake in left base of skull, right sphenoid, left orbit and multifocal aras in the vertebrae includind T8 and T11 through L1 and L4. There is stable uptake in both iliac bones and proximal femurs. So in comparison to the previous scan, they are stable with no new areas of activity. The final bone marrow results did give Dr Gowda some answers on how Emily's bone marrow is working and able to produce the red cell, platelets and white blood cells. There is marked thrombocytopenia (low platelets) which we know. 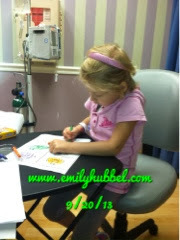 The bone marrow also provided us some answers with why Emily's platelets are having a harder time to come up when on treatment. The right side of her marrow shows 70% cellular make up of red cell! platelets and white blood cells. Dr Gowda said children on chemo they expect to see 70-80%. Emily's left side shows 50% cellular make up. These answers some questions on the platelets. Because of this though Dr Gowda wants her platelets to always be above 30, so this could mean that she has more platelet transfusions while on the chemo regiment. Dr Gowda agreed with moving forward and doing two more rounds of the Avastin/irenotecan/temodar trial. Thankfully today her platelets were 41 and she didn't require platelets and she was good to start. So today started day 1 of round 9!!! Wow round 9!!! Scary, but Emily has had a lot of chemo under her belt, but she is doing great. Dr Gowda doesn't feel it's a time to not do anything, and honestly I'm not there either being that she just progressed in December. But as parents it so hard to keep it going, knowing so much more now that what we knew before. But stopping could also mean giving the neuroblastoma time to come back. So we move forward, two more rounds them back to Michigan for scans. Hopefully the next visit is nothing like this one was. Dr Gowda still wants Emily to get a bag of her stem cells sometime in the future, but he is ok right now with holding off on them. Today while getting her avastin, Emily started doing some of the work that was sent home from school for make up for missing today. So proud of this girl, she just keeps rocking. Dad and I love watching her learn, and she is doing so well at school. Daddy went and had lunch with her again yesterday and she enjoys that. She also is really starting to get used to the Benadryl and doesn't sleep as long as she used to with it. But today put a interesting day with the fire alarm going off at the hospital and everyone having to go out. Interesting. Thankfully Emily was done and Elaine was able to get heperineze her line and when we got home, I went ahead and deaccessed her. Remember to hug and kiss your kids and tell them you love them. Have a good weekend. 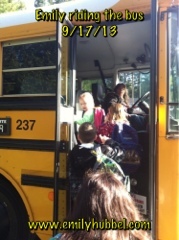 Emily was so excited, she was able to ride the school bus yesterday for the first time with her BFF. It's a big deal for dad and I to let her ride the bus and even harder for dad. 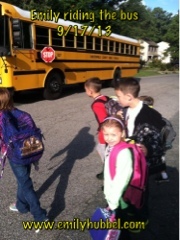 Dad drives Emily to school every day and walks her to her class, so this is hard on him. But it is also hard on us because of germs and worrying about the other kids, but we also know we can't protect her from everything. However Emily is doing great and loves it. We do know that there seems to be lots of sicknesses going around, so that is another concern for us, worrying about her getting sick since her immune system is compromised, which could mean hospital inpatient sickness or even fatal. 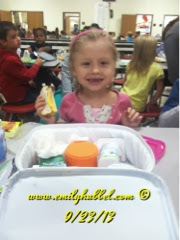 We are constantly on her about keeping her hands washed and hand sanitizing her hands often during the day. If flu season is as bad as it was last year, Emily will be staying home and we will have the home bound teacher come again. Just a quick update. Remember to kiss your kids and tell them how much you love them. We finally got the call from Dr Sholler tonight. Results are stable with not much change from the previous scans in July. She said preliminary results on bone marrow and MDS are negative, but she will get the final results by Thursday. Doug and I are happy there isn't any progression and so far bone marrow looks good. Platelets are most likely not recovering as quickly because of the continuing of treatment, but they could be worse. We have a few options of treatment, and we will meet with Dr Gowda this week to go over options and what we are thinking moving forward. 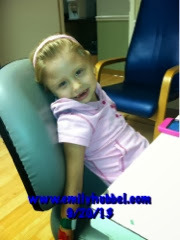 Emily also needs to have her platelets checked because the last time they were checked was last Thursday. We most likely will do another two rounds, but Dr Gowda wants to also talk about Emily getting some stem cells back to help her platelets. So we have some things to talk with him about! Emily looks great and has been eating well. 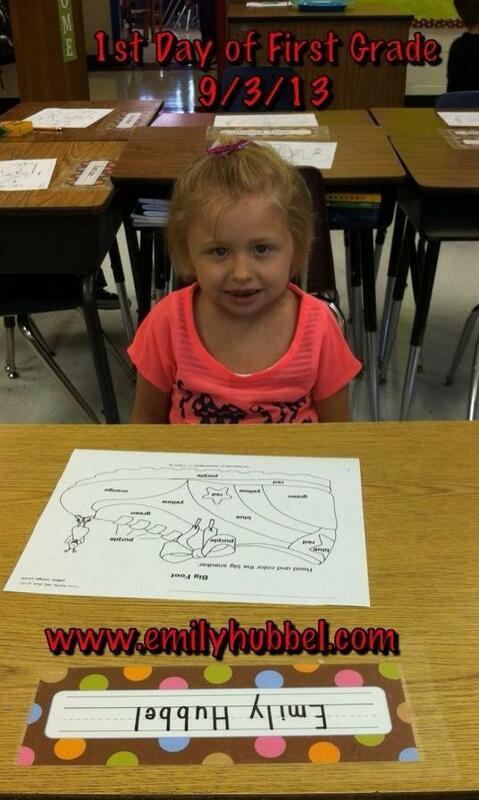 Dad and I are so happy with how well she is doing at school and enjoying it. She is growing up and becoming so independent. She told daddy when he drops her off at school if he could just take her to the door so she can walk to her classroom by herself. Daddy said she did well and didn't even turn around to see him, but almost sad that she is growing up. Thank you for all the love, thoughts and prayers for our girl as she went through scans. We are still hoping to hear those words one day of clear, so we will continue on the fight and we are hopeful to get there. Please remember to hug and kiss your kids and tell them how you love them!